Allow the most popular kitchen cabinet styles in Pompano Beach to help inspire your kitchen remodel. The style of your cabinets will impact the entire look of your kitchen, as well as its overall functionality. There are elaborate kitchen cabinets and simple designs too; in fact we’ve got something for every style and budget on this list! Hands down, the most popular type of kitchen cabinet right now is shaker style. Shaker cabinets are known for their five-piece flat-panel look that includes a frame with four pieces and a single flat center panel. Shaker cabinetry’s origins relate to old-school Shaker furniture, which embodies a classic, clean look with simple lines and a focus on productivity over fancy bells and whistles. The great thing about shaker style cabinetry is that it goes in almost any kitchen, from traditional to country to modern. The type of wood, wood stain and paint colors vary considerably, as do available hardware. There are plenty of ways to save money on shaker cabinets, for instance the center door panel can be swapped out for a more affordable material. Also, using natural finishes instead of paint will save money. Of course, buying wholesale cabinets from Tops Kitchen Cabinet will always help keep you from breaking the budget. Inset cabinets sit inside of the actual cabinet frame, as opposed to jutting outside of the cabinet. It requires additional work to create this look, as exact measurements must be taken into consideration. As a result, this type of cabinetry will cost more. In most cases, this type of cabinet has exposed hinges, meaning you will need good-looking hardware. These hinges will add more costs on; remember to factor in the cost of two hinges per door. Louvered kitchen cabinets are far less common but still worth considering if you’re seeking a more unique look. Horizontal wood slats, reminiscent of shutters on a window, distinguish louvered cabinets. The only drawback is the cost; you are going to pay a pretty penny for this style of cabinetry. Many homeowners opt to install louvered cabinets in only some areas, where it actually serves a purpose besides just a nice architectural touch. For instance, since these cabinets are often made with actual slits between the panels it allows for ventilation that traditional cabinet doors do not. As a result, they can be useful on cabinets that need ventilation, such as a drying cabinet, cable box cabinet, or a cabinet situated near a radiator. Flat-panel kitchen cabinets are constantly increasing in popularity as a more clean and modern look takes precedence. Contemporary and modern kitchens look great with flat kitchen cabinet doors, plus they are easy on the budget as they lack fancy details. Distressed cabinets are a style many people can‘t get enough of, and the great thing is they are pretty easy to achieve. You can install any type cabinet and then have certain techniques applied to give off that distressed appearance, without actually ruining the cabinets at all. This is something you want to be very certain about though, as it typically costs as much as 15-20% more to have a professional apply a distressed look to your cabinets. If detailed paneling on kitchen cabinets speaks to you, than beadboard style cabinets may be your go-to. 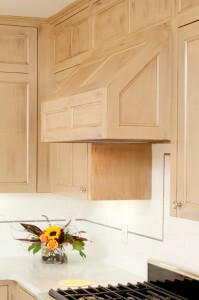 There are different looks with this style, but for the most part the center of the cabinets include beadboard paneling. Beadboard was a popular wall treatment prior to plaster, drywall and paint, although it still remains a hot trend in upscale homes and kitchen cabinets. The only thing to keep in mind is how much extra work it is to keep the lines and detailing on this style of cabinetry looking clean. If your style is not fitting in with anything you see there is always the option of going custom. Custom kitchen cabinets are the most costly because they are made for you, fit to your style specifications and dimensions. This level of craftsmanship doesn’t come cheap, but should last for many years. Custom cabinets give you the unique opportunity to combine the look of multiple styles, or create something completely unique. The interior of cabinets are more affordable to customize because often you can DIY these customizations. Plus, by transforming the interior of cabinets you make them more practical for your lifestyle and needs. These changes can be made post-renovations as well; giving you the chance to save up some money after the kitchen is complete. No matter what type of kitchen cabinets you’ve got your eye on, Tops Kitchen Cabinet offers the lowest wholesale prices on the highest quality kitchen cabinets, countertops, and more.